As students prepare to depart for different spring break destinations next week, keeping safety in mind is an important part of having a good time and escaping the stresses of classwork. As tourist and resort destinations are flooded by an influx of revelers this time every year, college-age travelers in particular are advised to take their well-being seriously. “We know that a lot of students like to go to the beach or on cruises, and we want to make sure when they’re away from home that they are aware of their surroundings and how to stay safe. It’s a very different situation when you’re not on the campus, and we try to educate students about traveling safely so they won’t end up in a position that they don’t want to be in,” said GTPD Officer Preston Moss. Setting regular check-in times and following through with them can help prevent situations where relatives and friends cannot get in touch with students when traveling. Letting them know departure and arrival times, living arrangements and the best way to be contacted while away can be reassuring for everyone involved. The officers stress that students do whatever it takes to make sure that their belongings are kept secure, especially in places where people are more professional when it comes to pick-pocketing. “It’s important to let people know where you’re going and what your plans are before you leave. When you get to your destination and you’re walking around town, I strongly encourage students –especially guys—to carry their wallets in their front pocket, since it’s so much easier for thieves to steal from back pockets without being noticed. If you want to rock a fanny pack, then rock a fanny pack,” said GTPD Officer Bradley Latham. Generally speaking, much of the same advice that officers give students when walking around on campus after hours still applies when going away for the break. When traveling, it is important to avoid going anywhere alone, especially in an unfamiliar place, and to limit the amount of money that they carry with them. The officers also understand the realities of college spring break, and where drinking is concerned they encourage students to monitor their beverages carefully and never accept one that has been opened. “We always stress whether they’re here on campus or wherever they’re going that if they choose to drink, they do it safely and responsibly. Binge drinking can be an issue anywhere, so moderation is the most important thing that we instruct students to think about. Being intoxicated in a foreign place can make them an easy target,” Officer Latham said. Safety precautions can be important even before the getaway plans are made. Another pertinent aspect of spring break safety is knowing how to avoid travel scams. During the vacation season, scammers can create convincing deals online for vacation packages and the victims often don’t realize the false trip until they reach the airline ticket counter and learn that they have no flights booked. According to the Sileo Privacy Protection solutions website online, the best ways to guarantee that vacation plans are legitimate are to verify the businesses, read all of the details carefully to check for hidden fees, always pay with a credit card and buy directly from the companies themselves. Vacationers are advised to keep in mind that if a deal sounds too good to be true, then it likely is. 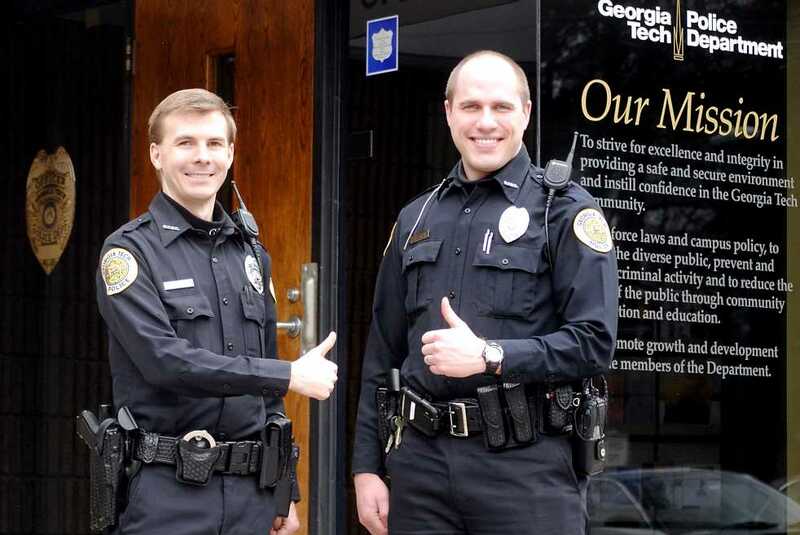 In the end, Officers Moss and Latham acknowledged that making safe choices during spring break on or off campus is the student’s responsibility, and the key to having an enjoyable and memorable experience. “Have a group of friends with you, and when you’re going out try to have at least one sober person there. Use the buddy system, have a good time and know your limits,” Officer Moss said. GTPD officers will be holding events from March 11-15 to distribute more information about safe spring break travel, like documents to have ready before leaving the country and hotel safety tips.